Three produced plays under my belt and I still do a double-take whenever someone refers to me as a playwright. This role was certainly never in my career trajectory nor my intention but if our life paths are traced along an interconnected series of “two roads diverged” choices – I’m happy to say that at one point (and not so long ago) – “I took the one less traveled by, And that has made all the difference”. 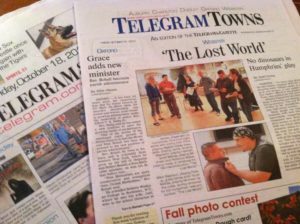 A couple of weeks back, my producer Dave notified me that a reporter from The Southbridge Evening News would be contacting me to discuss our upcoming auditions for The Lost World. With two sessions scheduled for Sunday January 28th and Tuesday January 30th, we’ve been engaged in a full court press to get the word out. Sure enough – she and I touched base and the results of that conversation made its way into a front page article that was published in the Friday January 19th edition of the paper. The Lost World is the second play I’ve written of the three – the middle child that just so happens to buck the trend by being my hands-down favorite. Back in 2011, I wrote my first play The Monkeybar Mafia after successfully finding a job following a one-year bout of unemployment. I had been employed in the Financial Services tech world prior to that which was actually a far cry from what I set out to do way back when I exiting college. So, I wrote The Monkeybar Mafia in 2011 (which was produced by The Gateway Players in 2012), The Lost World followed a year late and finally – Lost & Found was written and produced in 2015. But as I mentioned, The Lost World is easily the tippy-top of what I think I can do and I always wanted to see it come to life again – especially with the involvement of The Gateway Players to whom I completely owe my second chance at an extracurricular creative career to. You see, as far back as I can remember – I wanted to be a writer. As soon as I had a handle on the alphabet, I was making up stories – although usually my tales featured Godzilla facing off against any creatures that he hadn’t already battled in those movies I caught each Saturday on WLVI’s Creature-Double Feature. That was in my formative years spent growing up in Rockland, MA (a modest-sized town in the South Shore region of Massachusetts – roughly halfway between Boston and the Cape). In my sophomore year at Rockland High School (the first year they let you choose electives) – I made a beeline for the Journalism department and began writing for our school paper; a weekly called the RHS Veritas. While on staff, I contributed movie reviews and some ‘slice of life’ features on select faculty members and students. After three years of that, I was pretty sure that the newspaper business was the life for me so when I enrolled at the University of Massachusetts at Amherst in 1990, I immediately made Journalism my Major and added History and Spanish as complimentary minors. Over the 4 years, I wrote for The Daily Collegian – where I was on the Arts & Living Desk and largely penned movie reviews with the occasional feature article sprinkled in. While working for that paper, I wrote alongside a great writer – Jon. He and I would survey the upcoming movie release schedule and divide & conquer. I’d say we were the Siskel & Ebert of our day but there was already a very real Siskel & Ebert in our day – so our reviews may have been read but our thumbs remained largely ignored. That’s all it took: 3 years of high school writing and 4 years of college (plus a decent amount of tuition) for me to decide that my heart just wasn’t in it. At the time, I didn’t know why – not really. So, I just accepted my diploma feeling legitimately proud of what I had accomplished and then decided I would take the Summer to figure out my direction. I could still put that degree to work for something. I hadn’t lost my love of writing, I just knew that I didn’t want to have to get an internship and scrap & scrape to hopefully nail my big break. As the Summer wore on, I started failing the nagging itch that I needed to figure something out – especially as I watched my bank account savings dwindle. This Dodge Neon was not gonna’ pay for itself. While working at a local pizza place, one of the delivery drivers asked if anyone wanted to work “anywhere but here”. I took that as a sign and followed his lead to an interview with a big financial services company in Boston. I was hired immediately (because they were desperate and I had a pulse) and I told myself “one year and I’ll get back to writing”. Cut to fourteen years later. 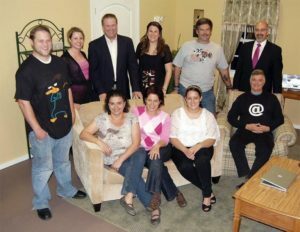 It’s mid-Summer 2008 and I had since relocated to the Central Massachusetts region having jumped jobs to a Westborough-based financial services tech company. While I was generally happy (good health, family and friends made sure of that) there was a restlessness in me. One August night, I went to go see my wife-at-the-time (Andi) in a performance of The Sound of Music; produced by The Gateway Players. I didn’t know what they were capable of but obviously I knew her – and I knew she could really belt out a number – so, the evening would certainly be pleasant. Aside from that – walking in, I had NO IDEA what to expect from the rest of them. Three hours later, I walked out awestruck. She was fantastic as was the whole production. On that warm summer night – as sure as I was (once upon a time) that I did not want to be a journalist – I was now equally hellbent on getting involved with theater in some capacity. This coming from a guy whose only previous acting experience was during my Senior Year in High School when a girl whom I had a massive crush on asked me to follow her to our High School Spring Musical auditions for Annie. I never did get the girl but I walked away with a supporting role as Rooster Hannigan. I remember at the time thinking I should have auditioned for something earlier in my school career and then just chalked it up to lost chances. So on that summer night in 2008 – as the last remnants of a storm front exited (with slight booms still heard in the distance), I stood in the parking lot waiting for my then-wife to exit the auditorium and really gave thought to the announcement Gateway posted in the program. They were doing One Flew Over the Cuckoo’s Nest next and needed a lot of men to audition. With a cool breeze sweeping the last of that warm, humid muggy air out – I decided that instead of doing what I normally do (which is go to work, come home, play with the kids, put them to bed, eat dinner, go to bed, rinse & repeat) I would go outside my comfort zone and audition. That thought was exactly the breath of fresh air I needed. I auditioned and got a role as Aide Warren – Nurse Ratched’s right-hand man in the show. It was a minor part (all told roughly 38 lines) but I was on stage a lot and was called upon to be a menacing figure. I’m 5’ 9” and average build so instead of looming over everyone, I decided I would just make my character into this pathetic, bellowing pitbull of a guy – which is so far removed from who I usually am. I remember loving the rehearsals because it injected something so fresh and vital into my life and in turn that made me view where I stood in a more positive light. I may not have pursued that career in writing but I realized there is never a moment where it’s too late – so long as you are drawing breath. Following that role – I performed in several others with Gateway over the next couple of years – “learning on the job”. In 2010, at the rock bottom of the economic collapse, I was laid off from my company. As I was unemployed and feverishly searching for work (especially with a little boy and girl at home) – I decided that when I finally got a job and got back to work, I would filter that experience of being a temporary “stay at home Dad” into something more creative. That spark ignited my first play – The Monkeybar Mafia – which was loosely-based on that one-year bout of unemployment. While that play is fiction through-and-through, there is no doubt that I layered in a lot of personal experience into the story I came up with. 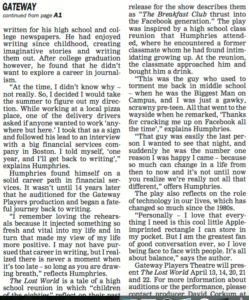 For my first play, I took the old maxim to heart – “write what you know”. 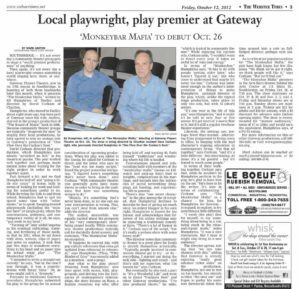 Having had a great experience working with Gateway on stage, I approached their Board and petitioned for a slot for Monkeybar in their upcoming 2012 season. I also sought out my former Cuckoo’s Nest director, David Corkum – and courted him to direct. 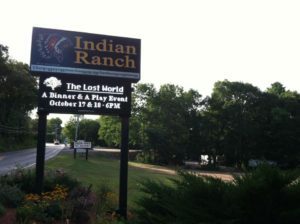 He agreed and in October 2012 we premiered – performing six shows to packed audiences at the Gateway Barn in Southbridge, MA. I’ll never forget that opening night and the first time someone in the audience laughed at a funny line. Or the moment midway through Act II when there was a loud, audible gasp from the audience as the story pivoted on a painful spot. We did THAT to them and it was so much more than rewarding. Hearing a reaction to things I wrote and the cast brought to life nourished me – providing a sustenance just as vital as food and water to my continued existence. 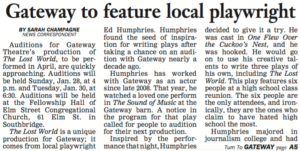 The thing is, there was a one-year span between when Gateway approved my play for their 2012 season and when production actually began. They met and made their schedule in September 2011 and we weren’t due to audition for Monkeybar until August 2012 – with the show going up in the Fall. As excited as I was to see this come to life, I had the creative itch nagging something fierce the moment I found out my dream was destined to come true. With ideas constantly churning in my head, I went to an unofficial class reunion in September 2011. That was during my 19th year removed from High School so my graduating class was still a year shy of the big 20th. Because Facebook had exploded and so many “old friends” had connected on that site, a bunch of us decided to meet up in Boston one night in September 2011 to eat, drink and be merry in person. 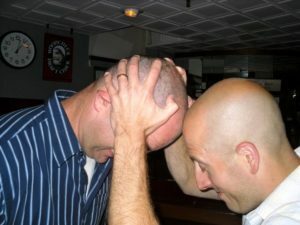 Although I was a bit of a quiet guy in High School (keeping to my smaller circle of friends due to an innate shyness that vexed me at times) – college saw me burst from my shell – so by this point in my story, I was largely comfortable with who I was and was very happy to help organize that big city get-together. I had gone to our 10-year reunion and was slightly saddened by the middling turnout. I graduated with roughly 165 classmates in 1990 and when we reconvened at a Holiday Inn ballroom in Taunton, MA in November 2000 – I was shocked to see only 60-or-so people show up; and half of those were significant others that were dragged along by people who wanted to make sure they had at least a Plus One to keep them company. With that older image in mind of a reunion attended by so few people compared to the roomful of people I was surrounded with these 9 years later, I suddenly knew exactly why that was the way it was. The first time around, we were only 10-years removed. It was too soon and for some people the sting of High School (which is only four years but sometimes feels like forty and the longest, most momentous years in a life) anyway – that leaves its mark. People need time; or they need to get a little older and accumulate kids and bills and then have any excuse to get out for a night and rekindle the relationship with who they were way-back-when – and realize why it’s so important to not let that go completely. 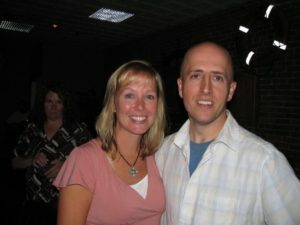 So, when I went to this quasi-19 year reunion and walked smack into a room bursting with people (close to 100 which was AMAZING since we didn’t spend too many calories trying to find anyone not on social media), I knew that we were living in an age where so long as you remained on the grid, you could find someone. Nobody could hide anymore. Not really. At one point, I was at the bar getting a drink when this guy (the sturdiest, stockiest guy I’ve ever seen close-up) paid for it. (And no – it’s not the guy in the pic above nor the one below). I’m very good with faces BUT I just could place his so I politely asked his name. He told me and immediately my stomach dropped. This was the guy who used to torment me back in Middle School – when he was the Biggest Man on Campus and I was just a gawky, scrawny pre-teen. We had not seen each other since the day we grabbed those diplomas. I’m sure he never gave me a second thought in that first decade. I know he was the last person I wanted to think about. All that went by the wayside when he remarked “That’s for cracking me up on Facebook all the time.” My first thought was “When (AND WHY) did I befriend HIM?” and “Was I drunk?! ?” The second thought was “Drink up!! !” For the next 10 minutes, this guy and I talked – not about the old days but about now; about raising kids – especially daughters which we both had in common (he with 2 and me with 1). I thanked him for the drink (and the nice chat) and wandered off for a moment to sort of let that whole surreal exchange process. That guy was easily the last person I wanted to see that night and suddenly, he was the #1 reason I was happy I came – because so much can change in a life from then to now and it’s not until now that you realize we’re really not all that different. As I thought through this I looked out at the crowd of people – everyone having fun and most speaking to someone whom I don’t recall they ever hung out with back when we were young. So many cliques disassembled and so many different people recombined into something better. I took that all in and it hit me – “What would happen if you threw a reunion now (in the age of social media) and the only six people who showed were the six who claimed to have HATED High School the most.” Essentially, I looked at my reunion and saw it through the prism of The Breakfast Club. See, I grew up in an age where we played outside (in the neighborhoods and surrounding woods) from dawn until dusk; always hoping against hope that your Mom wouldn’t notice when the streetlights came on and you could stay out deeper into the night. At the same time – cable, VHS and Nintendo made its march into our homes leading the way to AOL, Facebook and eventually the Twittersphere. We had the best of all possible worlds. We could see the future coming down the road with all the gleaming techno-wizardry it brings with it (although no flying cars because no generation ever gets the Jetsons’ flying cars – AND CAN I GET AN AMEN!!!) – but we were kept cozy by the simple pleasures of playing Hide & Seek through the neighborhood while the fireflies flicker and light. The morning after the reunion, I decided to stave off my restless need to begin production on The Monkeybar Mafia ASAP and decided to distract myself by writing what would become my favorite exchange in The Lost World because it’s what the whole play builds upon. From there – and those two characters – I started working backwards and forwards, looking for a reason to bring them together with a few long lost classmates after all these years. The title itself holds dual-meaning. While this is another complete work of fiction, I sprinkled some of my own memories in the tale – gifting each of the adult characters with either something I experienced or heard of when I was in their shoes. For instance, when I was a kid – there was this amazing area in the woods that ran behind my best friend’s house. One day while exploring them, we came across these huge sandy depressions in a vast clearing that was ringed with trees. I was probably 8 or 9 at the time and yet running around the woods with nary an adult in sight was not that big of a deal in the early-80s. So we returned to the pits day-after-day and imagined all of the ways that they came to be. Most of the time, we pretended it was dinosaurs that lurked there in the evening after we had left – making the imprints with their massive feet – so would just come back and “hunt them” by rigging up makeshift traps. We never caught anything, naturally – short of a few nicks from the briers we crashed through on our way to-and-fro. I was obsessed with dinosaurs as a kid and used to check out the same book from the elementary school library all of the time – Sir Arthur Conan Doyle’s The Lost World (which was about Victorian-era explorers finding a savage land ruled by dinos). We cribbed the title and dubbed our discovery ‘The Lost World’ and that place quickly became something we found again-and-again all summer long. As kids so often do, eventually I started hanging around with other people and our Lost World faded – becoming nothing more than a real-nice childhood memory. In fact, as the years wound on – I never really thought of it. But when I started writing this play, I decided to gift that memory to two of the characters (former best friends) – mainly because through them I wanted to explore the difference between then and now; of living in a time of social media where you literally can find everything and anything you need in a nanosecond (Siri & Google have rendered the fine art of arguing trivial facts with friends a moot point) versus a time (not so long ago) when if you wanted to talk to someone you had to (as the old AT&T commercial said) “reach out and touch someone” or you know – go knock on their door. My Lost World is truly The Lost World. That said, this play doesn’t preach. I think it finds the beauty in the now – and if anything – it warns against getting a little too cozy with nostalgia. You can miss some beautiful sights if you are always looking back. But I admit, from memory I found a way forward and in the process became the accidental playwright.